I just saw a friend post an image of downtown Minneapolis and it had me remembering this shot I did last fall during a beautiful day. 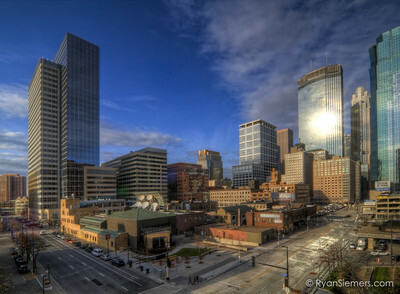 I was heading back from an AIA-MN convention and I ran into the site of one of my proposed projects for a highrise. 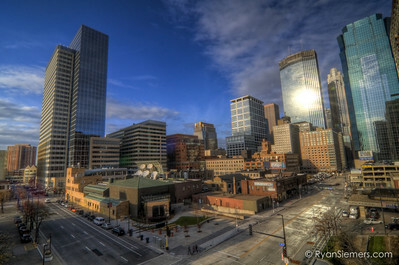 It was a great day to play around with a little HDR and my wide angle lens. However it's not a Tilt-Shift lens leaving me with fiew options to deal with converging vertical lines, if I wanted the focus of my photo to be of the gap that still exists in this location of downtown. These two images are a side by side comparison of a before and after of basic correcting for vertical distortion (called parallax) caused by a fixed lens. Newer PostGet Ready... Set...... GO!